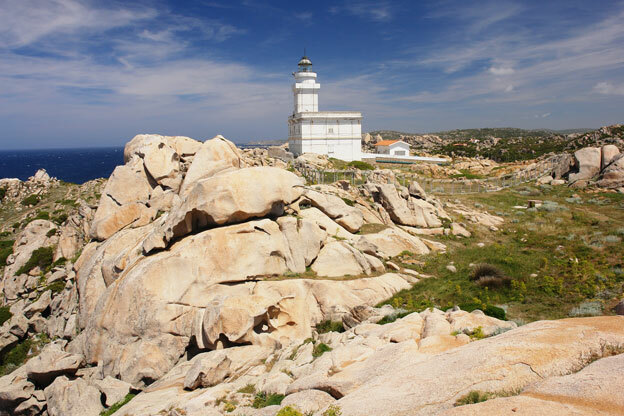 Situated on Sardinia’s northernmost point at Capo Testa is a lighthouse that acts as a beacon not only to repel ships away from the danger beneath the waves in the Straits of Bonifacio between Corsica and Sardinia, but also to draw tourists towards it. The reason so many people make the trek to this rocky peninsula is the stunning granite cliffs that over the years have been eroded into all manner of shapes and sizes. The cliffs and the coastline attract photographers from all over the world, all enamoured by the dramatic landscape and the opportunity to get the perfect shot; in fact, the lighthouse itself, a white building against the backdrop of blue sky with the rocks that lie haphazardly around its base, makes for a perfect picture too. Parking in the area is limited so it is always best to get to the headland early to get a space. Walking shoes are required and, after passing through the small gate, make your way down to the coves and let your imagination run riot as you decipher the myriad of rock formations that resemble everything from animals to cathedral domes. There’s even a few that look remarkably like famous people. 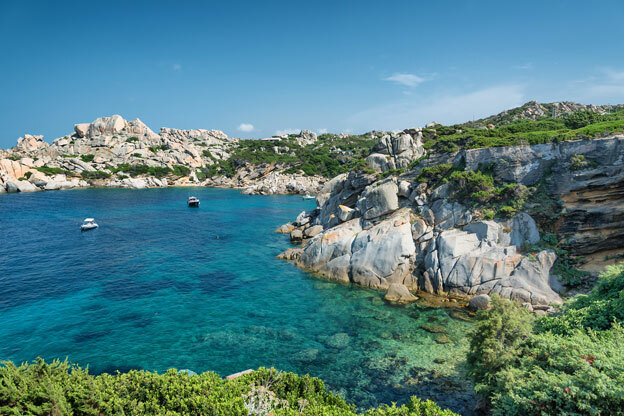 This shoreline on the island of Sardinia is the closest to Rome and therefore the Romans built small villages around their mines as they extracted the granite which was transported to Rome and used in the building of many structures within the capitol. Sadly, today very few traces remain of this Roman interaction with the land and, over the years, the shoreline has undergone many modifications. To the west of Capo Testa is Valle della Luna (Valley of the Moon), a picturesque valley that at times resembles a lunar landscape, hence the name. During the 1970s, it was a haunt of hippies who set up camps within the valley to enable themselves to connect with nature. The landscape is breathtaking at times; enormous granite formations jut from the earth like giant watchmen, other rock formations have been rendered smooth and, over the years, have become stained by the touch of people unable to resist stroking them. The vegetation is mostly scrub; heathers and wild myrtle stick out between outcrops of rock and tall thin grasses blow in the wind adding their own influence on the unusual landscape. The valley leads down to the sea where the waves relentlessly batter the cliffs, but despite this turbulence the feeling is always of calm. The beaches are slender but sandy and perfect for a picnic and their beauty will soon win you over. Visually they are a stark contrast to the rugged landscape of the valley and a welcome place to relax with a handful of secluded coves where you can feel completely alone and at one with nature. There is the occasional freshwater spring and pool, but on hot days it is advisable to bring water with you as there are no shops within the area to purchase any. In the 1970s, due to the huge influx of hippies staying in the area, camping was forbidden, but this has since been relaxed and it is permitted during high season only: a permit may be required so check with the tourist offices. The area still attracts the occasional ageing hippy, but has since become a popular destination for people who practice the hobby of geocaching. The valley may only be a mere 500 metres in length, but is well worth to spend some time exploring and hopefully getting that perfect picture too.